Current selected tag: 'Canada'. Clear. "There's a petition that calls for the United States government to adjust the border near Manitoba to give Canada the geographic oddity known as the Northwest Angle." The unofficial greeting in the bilingual Canadian city of Montreal has long been a friendly 'Bonjour, Hi!' But that standard is no more since a motion mandating store clerks to greet customers only in French was passed in Quebec's provincial legislature. The move reaffirms French as the primary language in the province, where use of English can be controversial. The motion - which is not a law - was passed unanimously, but the province's premier called the debate 'ridiculous'. Introduced by the fiercely Francophile Parti Quebecois, the motion 'invites all businesses and workers who enter into contact with local and international clients to welcome them warmly with the word bonjour'." This is a great example of how culture isn't just passively received, but it's actively constructed. The call to defend cultural traits of a region to maintain it's local distinctiveness is oftentimes why a region has a strong sense of place. Tags: Canada, language, place, culture, landscape. The actions of the Quebecois legislature to regulate free speech is a form of hierarchical diffusion. Here is a [slightly dated but good] video explaining the modern complexity of the French/English divide in Canada, especially as it relates to new immigrants. "I was inspired by 50% of the U.S. lives in these counties. map. I was wondering what the equivalent map for Canada would look like. I couldn't find one, so I created my own." During the U.S. presidential election much was made about the differences between rural and urban regions of the United States. Clearly the United States isn't the only North American country that has a highly clustered population distribution. This post is particularly interesting because it shows just how the population is impacted by the geography of the land. Like most civilizations, fifty percent of Canada's population is centered around waterways, an excellent resource for trade and communication to the bordering nation. "The area below the red line includes most of Nova Scotia, in Canada's east, but most of the population comes from the area a little farther west, in a sliver of Quebec and a densely populated stretch of Ontario near the Great Lakes." Admitted, the web Mercator projection of this map distorts the far northern territories of Canada, but still it hammers home some fascinating truths about Canada's population distribution. Land-wise, Canada one of the world's biggest countries, but population-wise, most of it is quite barren. What geographic factors explain the population concentration and distribution in Canada? I've written in the past about the aesthetics of the an ideal British landscape (as embodied in the anthem Jerusalem). The British ideal was to tame nature; the Canadians on the other hand, embraced the wildness of the natural landscape. Those difference normative views of landscape helped to shape national identity and inform land use decision-making processes. Tags: UK, landscape, culture, Canada, land use. This passage was written by Margaret Cote, a member of the Saulteaux people, who are part of the larger Ojibwa or Chippewa Native American tribe. Questions to Ponder: How does language shape cultural attitudes, traits, and customs? How does language shape a speakers world view and personality? How does language influence how a speaker may feel about place? Tags: Canada, language, place, culture. "From treasure maps to smart phone apps, geography makes sense of our world by describing locations, patterns and relationships of the Earth’s natural and social systems — both past and present. Canadian Geographic’s editors, along with the help of a number of Fellows of The Royal Canadian Geographical Society and other experts, compiled this ultimate Canadian geography quiz to truly test you. Think you’re a geo genius? Prove it!" These are 50 HARD questions (any student not from Canada that gets over 50% right should pat themselves on the back). I will only give you one of the 50 answers since most of you have never been to the explore the frozen tunda; pictured above is a pingo. Pingos form when groundwater is pressurized and forced upward in a concentrated area by advancing permafrost. This groundwater-saturated sediment freezes and expands as it’s driven toward the surface, causing the earth above to bulge and eventually break open. Tags: Canada, trivia, games, Arctic, landforms. "Half of Canada’s 33.5 million people live in the red part, the other in the yellow. More population divided maps (Source: reddit.com)"
Land-wise, Canada one of the world's biggest countries, but population-wise, most of it is quite barren. What geographic factors explain the population concentration and distribution in Canada? Tags: Canada, map, North America. A great illustration of population concentration and high density in Urban centers. 4.6 million of the remaining 17 million (approx.) live in British Columbia. First economically for trade routes you have the St. Lawrence river which was originally the most influential route for French explorers. You have Toronto the Canada's financial center which forms the core of the "Golden Horseshoe" region, which wraps around the western end of Lake Ontario, population wise a quarter of Canada's population lives here. Politically it makes sense that government would be set up in that area because of the population in that area. Which population leads to the social aspect because all activities of night life, restaurants, businesses, entertainment, malls, etc. are located in this area. And lastly, it makes easy access for United States and Canada to exchange tourism and jobs and goods. It's crazy to think how big Canada is and yet the majority of the population lives right on the border. Canada is almost in the Arctic Circle so most of the time you're going to have frigid temperatures and inhabitable land so its going to push people closer to the equator. Tags: Canada, language, social media, images, place, culture, landscape, tourism. "Here’s a winning question for your next trivia night: Where is the world’s largest island-in-a-lake-on-an-island-in-a-lake-on-an-island? According to stories published here and here, the distinction currently goes to a nameless isle within Victoria Island in Canada’s Nunavut Territory. On August 21, 2014, the Operational Land Imager (OLI) on Landsat 8 captured this natural-color view of the “sub-sub-sub-island.” The top image shows a close-up view of the unnamed island, while the bottom image shows a wider view of Victoria Island’s lake-littered landscape (download large image here)." Tags: Canada, trivia, remote sensing, geospatial. "How well do you know your Saskatchewan slang? At Insightrix in Saskatoon, Saskatchewan, we've got the prairies down flat!" Here's an entertaining clip on different regionalized vocabularies and a hint of accent confusion thrown in there. The portrayal is over the top, but it's all local vocabulary that life-long residents certainly understand. Here's 320 more Canadian slang terms for you (scroll to the bottom). Live languages are never as straight forward as the Royal Academies of Language would like them to be. Rules are crystallizations that get shattered in daily use. Canada got rid of the mandatory census, and is discovering it can no longer know much about itself. This article is about how Canada switched its census from being mandatory to voluntary, and how this has had many negative effects. By not having a mandatory census, Canada has saved the national government money, but in truth has really lost a lot. It is much harder to have accurate demographics for city planning, research purposes, and business marketing. Researchers are unable to tell the distribution of racial equality in neighborhoods, the demographics of neighborhoods, and are completley unable to track immagration. There is a voluntary census in place, but this produces much lower quality results, and is expensive to obtain this data. This relates to the theme of how information such as census data is used, and through this article you are able to tell how important something like the census is to providing data for so many different oraganizations/people. As much as Americans hate the Census, this article proves that it is an important governmental instrument. There are many in this nation that would probably desire a similar proposal. They should read this article before ever speaking on the subject again. A Census is nessacary to tell us about ourselves. How can a government formulate a public policy, if it does not know who lives within its borders? "If you think the United States is every immigrant's dream, reconsider. Sure, in absolute numbers, the U.S. is home to the most foreign-born people — 45.7 million in 2013. But relatively, it's upper-mid-pack as an immigrant nation. It ranks 65th worldwide in terms of percentage of population that is foreign-born, according to the U.N. report 'Trends in International Migrant Stock.' Whether tax havens and worker-hungry Gulf states, refugee sanctuaries or diverse, thriving economies, a host of nations are more immigrant-dense than the famed American melting pot. Immigrants make up more than a fourth (27.7 percent) of the land Down Under; two other settler nations, New Zealand and Canada, weigh in with 25.1 and 20.7 percent foreign-born, respectively. That's compared to 14.3 percent in the United States." Tags: migration, population, USA, Australia, Oceania. the us is not the choice nation of nations. it is not the most sought nation for migrants. that means we must be doing something right or wrong. Facts put major cultural issues into perspective. The facts found in this NPR article indicate that much of the world - and not just the United States - is grappling with immigration issues. Although the U.S. has the largest foreign-born population in raw numbers, it does not make up as large a percentage as the overall population as some other nations. Compared to the U.S.'s immigrant population of 14.3%, Australia's foreign-born subgroup makes up 27.7% while New Zealand's hit 25.1%. That is over one-fourth of the entire population in each country. Australia and New Zealand are ideal as they are both relatively safe, stable, progressive, and economically developed nations that have room to grow. The issue, especially for Australia, is taking in high numbers of unskilled workers who can be difficult to integrate into the economy. The U.S., mainly from the right, has also complained about this trend. Many migrant workers, however, are filling low-wage, unskilled jobs that non-immigrant workers shun and have no desire for. Considering that immigrants who fill these jobs earn their keep, pay taxes, and stimulate the economy by spending their money outweighs the potential economic burden. The truth of the matter is that natives in Australia and the United States are more fearful of the cultural, social, ethnic, religious, and linguistic changes that often take place when outside groups settle within a new country. This diversity can surely enrich a society. It can also stress out traditionalists, fearful of change, and cause social unrest and animosity. The important thing for Americans to understand is that we are not the only country wrestling with a globalized world in which people transcend boundaries, diversity is on the rise, and change happens. Just look to Oceania. With some countries having as many as 25% of people being foreighn born I wonder how much of this diversity could cause social upheaval. As we learned in class sometimes cultural differences can cause major issues in a country, and often times without a major culture tying every one together the country will inevitably split up or have civil strife similar to what we see in parts of Europe from mass migration. I wonder what effect migration will have in places like Australia 5-10 years from now. Especially if the cultures these immigrants come from are drastically different then Australian culture. Sky-high food prices in the North have led many residents of Iqaluit to turn to Amazon Prime to save on necessities. But is that a sustainable solution? Nunavut is remote...far more remote than most of our students can imagine. They live over 1,000 miles from any city with half a million people. The entire territory is enormous, but sparsely populated with only 36,000 people. Try to image getting commercial goods to such a remote location. The Canadian government has invested heavily to subsidize systems to get food products and other necessities to Nunavut. Still, the transportation costs are so high, and the numbers are so few that economies of scale can’t help this situation. Enter Amazon Prime in 2005, and the online retail giant began offering free shipping for “Prime” customers for a flat yearly subscription fee (today $99 in the U.S.). This was simply too good to be true for many customers in far-flung settlements in Nunavut. Amazon, probably not anticipating the overwhelming transportation costs associated with a place like Nunavut, in 2015 stopped offering Prime membership for Nunavut customers that do not live in the capital city of Iqaluit. Still, the capital city looks to Amazon Prime more so than the Canadian or territorial government as their lifeline to the global economy. Some even argue that Amazon Prime has done more to improve the standard of living and providing food security for Nunavut residents than the government. Scoop.it Tags: Canada, distance, indigenous, poverty, development, economic, food, food distribution, density. WordPress TAGS: Canada, distance, indigenous, poverty, development, economic, food distribution, density. "It’s no secret that the Great Lakes are suffering tremendous ecological strain — Lake Erie was even pronounced “dead” for a time during the 1960s because of an overload of phosphorus from municipal waste. Back in 1615, though, when the entire region was pristine and explorers Samuel de Champlain and Étienne Brûlé gazed out together from Lake Huron’s shores, they dubbed it la mer douce, 'the sweet sea.' Today roughly one-quarter of Canada’s population and a 10th of America’s population drink from the Great Lakes basin; the beleaguered lakes alone hold more than a fifth of Earth’s freshwater." Questions to Ponder: What watershed do you live in? Where does your drinking water come from? When you flush the toilet, where does it go? How are places in your watershed linked? How does this similar map shed more light on these issues? Tags: Canada, environment, resources, water, spatial, scale. It is amazing, in a sad way, to see how in just four centuries these lakes have gone from "la mer douce" to "dead." This map is a reminder of the damage humans do to the environment on a daily basis, and of the importance of protecting our natural resources. Considering the fact that these lakes hold roughly one fifth of all of the fresh water on the planet and provide drinking water for millions of people in both the U.S. and Canada, we need to think about the impact we have on the world around us and how that impact can come back to bite us on the rear end. More than anything I love the idea of using watersheds to connect students to their location environment and to think about places that are beyond the backyard, but are connected to them. If they see themselves as more intimately connected to these places, it can only increase their spatial awareness, geo-literacy and hopefully their commitment to protect their expanded backyard. This is an effective way to help students 'jump scale' in a way that will still keep things relevant to their lives. Questions to Ponder: What watershed do you live in? Where does your drinking water come from? When you flush the toilet, where does it go? How are places in your watershed linked? Tags: Canada, environment, resources, water, environment depend, spatial, scale. "From icebergs and Inuit legends to polar bear organs and exploration disasters, 50 questions to truly test your northern knowledge." These are 50 HARD questions (any student not from Canada that gets over 50% right should pat themselves on the back). A newly constructed bridge in northern Ontario has heaved apart, indefinitely closing the Trans-Canada highway — the only road connecting Eastern and Western Canada. At least one town has declared a state of emergency. One bridge going down isn't noteworthy, but when that functionally separates Canada in two...that IS noteworthy. A detour into the U.S. and around some Great Lakes is one heckuva detour. Last night the Liberals in Canada had a resounding victory...this will profoundly impact Canadian politics but also will change some of the frostiness in U.S.-Canadian relations. Trudeau was stated that Canada will return to its old role in the world by reversing many of the conservative stances of the Harper government instituted over these last 10 years. As Americans, we often forget about how major a player Canada is in all of our economic sectors. But, despite the ignorance of most American citizens on Canadian politics, the results of the coming election in Canada will have a major impact on the lives of every US citizen in the next few years (at least until the next US presidential election). After World War I, Canada drew up classified plans to invade the U.S. Meanwhile, the U.S. had its own secret plot to create the "United States of North America." I never knew 1921 to 1930 was such a frosty time in Canadian-U.S. relations that BOTH sides drew up possible invasion plans. Judging by these amazing arrows, these plans were never seriously about to be executed, but it is a good reminder that geopolitical partnerships (and rivalries) are ever-changing. Today, if there are border tensions between these two allies, it might just center around the Arctic as it's geopolitical importance is rising, but the U.S. doesn't have a very successful track record against Canada. Also, I did enjoy the 1920s reference that Americans simply assumed that Canada (once the British Empire was dismantled) would naturally be absorbed by the United States. Tags: Canada, geopolitics, political, war. Both the U.S. and Canada had a similar thought process with the "just in case" clause if either of the two became enemies. both countries had their "scouts" look of the geography of each country and speak to locals to see where they stood, to find precise locations where they could attack and control. Each location had plans to destroy infrastructures and bridges to allow time to either escape or control depending on how the situation played out. It was both crazy and smart by the two nations to do their research with in their perspective locations to validate their attacks. "Can I copy your homework?" "Sure just change it a little so it doesn't look obvious." After the first world war, Britain ended up owing the United States approximately $22 million leading to huge disagreements over payment. As such in a sibling-style rivalry, Canada and the United States both drafted invasion plans which were almost identical. While Canada would send forces down to attack Seattle, Portland, Minneapolis, Detroit, and Albany among others, the US would send troop north from the same cities to take Vancouver, Winnipeg, Quebec, and Montreal. It seems like it would be totally impossible now with Canada and US being such powerful allies but with the growing tensions between Trump and Trudeau who knows what could happen. If you are questioning who would win though? I would I would put my money on the 46-year-old Justin Trudeau being able to trump the 72-year-old Donald Trump. This is a great juxtaposition of communal identities. Before becoming a part of Canada, this was the Cathedral of St. James. As a part of the British Empire, places such as Victoria Square became a part of the Montreal landscape. In what appears to me as a symbolic strike back against the British Monarchy's supremacy, this Cathedral is renamed Marie-Reine-du-Monde (Mary, Queen of the World). The fact that the Hotel Queen Elizabeth is looming overhead only heightens the tensions regarding whose queen reigns supreme; this isn't the real issue. The dueling queens served as a proxy for tensions between British political control and French cultural identity in Quebec several generations ago. I was recently in Montreal; my last few Instagram posts aren't the prettiest pictures of my time in Canada. I tried to select images that represented geographic concepts and would be the things I'd mention if we were on a walking tour of the city. Tags: Canada, social media, urban, economic, images, place, culture, landscape, tourism. All the latest news on the the search for the lost ships of the Franklin Expedition, as well as information on past searches, the technology used in the searches, historical information about the Franklin Expedition itself, and much more. Come learn about one of the greatest discoveries and explorations in our time that recovers the memory of explorers of yesteryear. These 6 lesson plans are incredibly engaging and are a fantastic example of geographic concepts. Tags: Canada, teacher training, edtech. Canada is a massive country, yet it has one of the lowest population densities in the world. Despite this, Canadians have made a wide impact on their land, much of it visible from aerial and satellite photography. Hydroelectric facilities, roads, mines, farms, ports, resource exploration, logging, canals, cities, and towns have altered much of the landscape over the years. This is a great set of images showing the human impact on the environment, with a special nod to our neighbors for the north. These images have an artistic beauty and I hope every geographer maintains a sense of wonder at the details and beauty of the Earth. 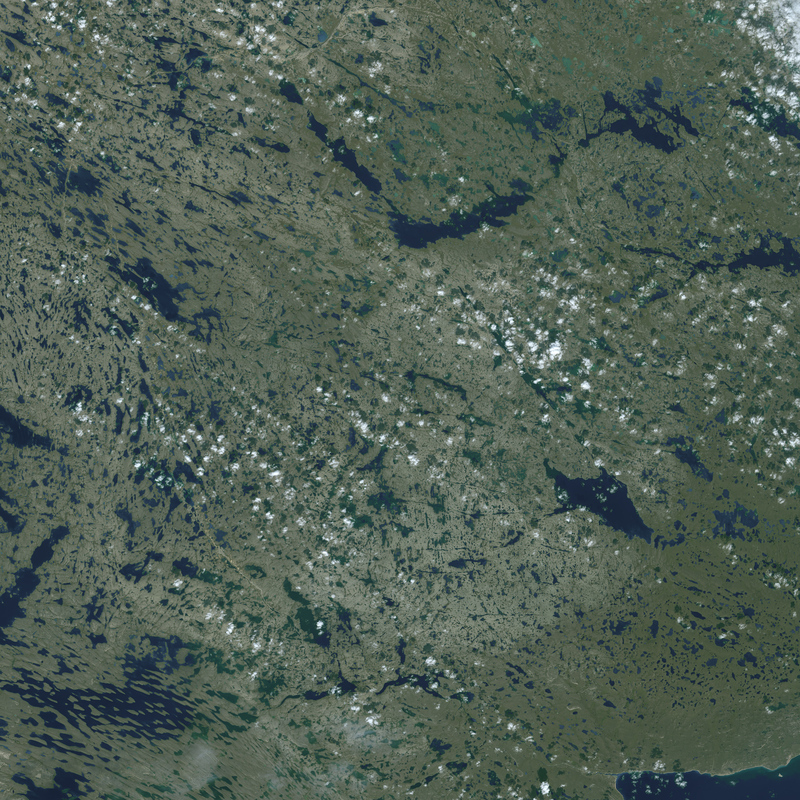 Tags: Canada, images, art, remote sensing, land use, landscape. This shows how even small populations can make a big impact on the world from the changes in urbanization.